Do you remember the American pop culture craze, slap bracelets? Slap bracelets were a popular teenage accessory if you grew up in the 80s. I remember wearing them as a child and even trading them in school for different accessories. The slap bracelet is beginning to regain its popularity. The exciting simply jewelry is fun and easy to make. The bracelets are timeless and kids today still enjoy them. Take it a step further and design your own slap bracelet. The process is easy and fun. Let the children join in on the decorative process. You can recycle an old metal measuring tape for this process. There’s no need to buy a new one. We will be redecorating the bracelet to give it a fresh, fun and custom feel. Measure your wrist. The idea is to make sure the snap bracelet does not fit so tightly that it may possibly cut into the skin of the wearer. Give yourself enough room that the bracelet fits loosely around your skin but does not come off your hand. To do this use about ½ more metal than your write calls for so the bracelet overlaps itself. Then insert two fingers to add some space for the bracelet to move. Cut the measuring tape to that specific length with the scissors. Smooth your metal bracelet. This is an extremely important part of the process. Take the sand paper and smooth the sharp edges of the metal down. It’s very important to make sure the edges are dull so the bracelet will not snag on clothing or cut into the wearer’s arm. 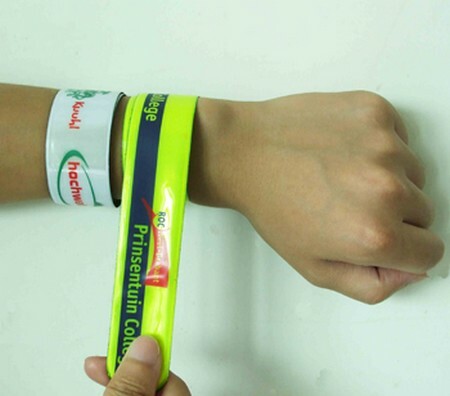 It’s imperative to remember the snap bracelet is made of very thin metal that may slice, cut or otherwise injure the person wearing the snap bracelet. Safety is always first priority. You need a way to close your slap bracelet. Add a closure to your bracelet. Glue magnetic snaps to the bracelet has a little clasp. This way when the bracelet easily comes undone and re snaps without permanent closure. This magnetic additions gives your bracelet enough security to stay on your arm. Customize your new slap bracelet. This is your chance to make your new bracelet really your own. You can place any decoration you want on the bracelet. You can cover the bracelet, use fabric paint to paint on it or more. You can place pictures on or use glue and glitter to make it your own. Create your own flare and style.